You are currently browsing the tag archive for the ‘Ward Kimball’ tag. After ‘Man in Space‘ (1955), ‘Man and the Moon’ is the second of three Disneyland broadcasts documenting man’s plans to conquest space. ‘Man of the Moon’ deals with the conquest of the moon, and consists of four parts. The first, largely animated, tells about man’s fascination for the moon. 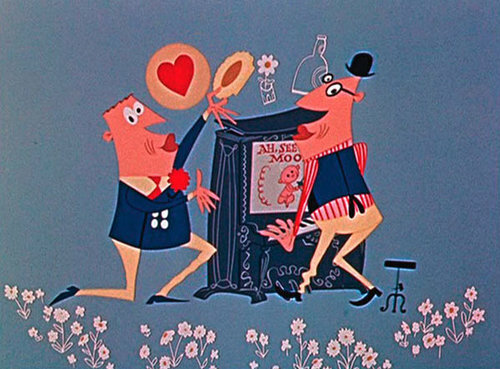 This sequence is a highlight of ‘cartoon modern’ style, and is full of director Ward Kimball’s trademark zany humor. It’s also the highlight of the documentary, despite the studio’s efforts to evoke the first mission to the moon in the fourth part. The second features Ward Kimball in real person, telling us facts about the moon. The third part is hosted by German rocket scientist Wernher von Braun, who tells about a possible mission to the moon. Surprisingly, Von Braun does not try to land on the moon, but merely wants to fly around it. His plans are shown in the fourth part as an “on the spot account of the first expedition to the moon”. Unfortunately, this is not as exciting a finale it possibly was in 1955, even though weightlessness is shown quite convincingly using special effects. 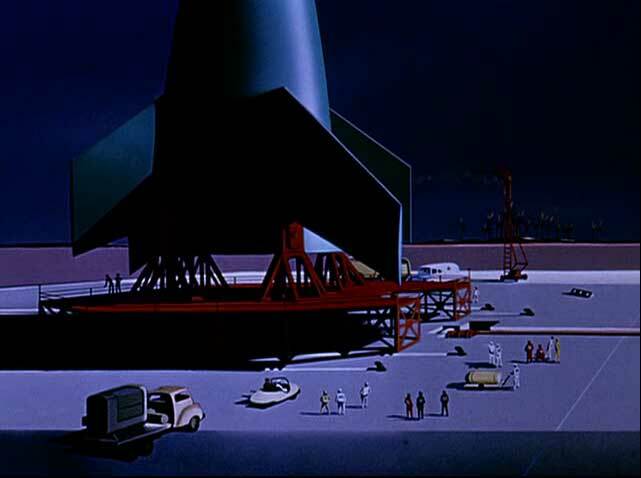 In 1957 Disney even showed more ambitious space plans, in ‘Mars and Beyond’. ‘Man in Space’ is a Disneyland special about man’s conquest of space, which, two years before the launching of Sputnik, was still a dream at that time. The documentary includes information about rockets, weightlessness and concludes with an exciting account of man’s first space travel, based on the designs by rocket engineer Wernher von Braun. Von Braun is one of three German scientists featured in the program, the others being Willy Ley and Heinz Haber, demonstrating the enormous influence of German scientists on American science. Ley had fled Nazi Germany in 1935, but Haber stayed there till the end of the war, and Von Braun was even responsible for the deadly V2 rocket, a technical tour-de-force, but also the Nazi regime’s most fearful weapon. ‘Man in Space’ is shortly introduced by Walt Disney himself, quickly giving the presentation to director Ward Kimball, who remains the main host of the program. Kimball is clearly in his element here. His own wacky cartoon animation style is featured in a short history of man’s attempts to enter space, and in Haber’s accounts of ‘space medicine’. Indeed, he later called the space series, of which ‘Man in Space’ is the first entry, the creative high point of his career. 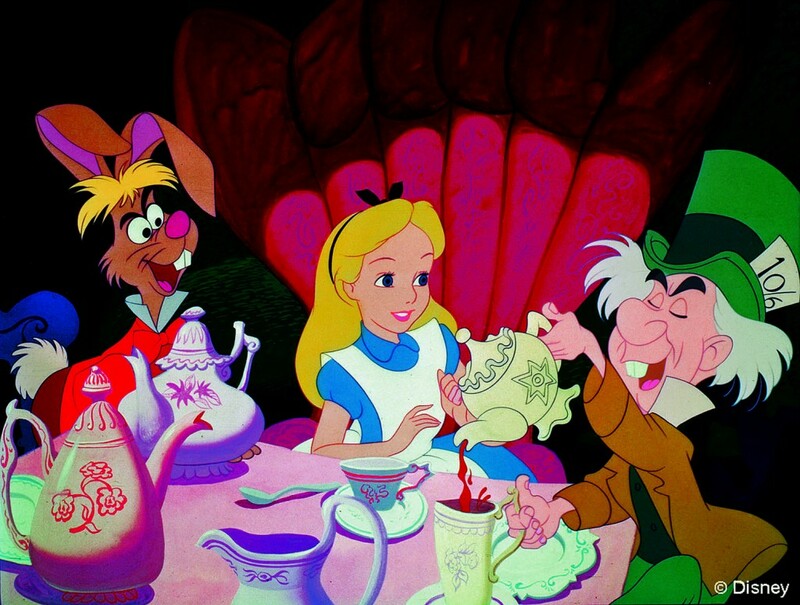 Throughout the movie, the use of animation is sparse, however, and the animation itself very limited. Nevertheless, its use is very effective, especially in the visionary concluding part, with its typical fifties science fiction designs. ‘Man in Space’ would be followed by ‘Man and the Moon‘ (1955) and ‘Mars and Beyond’ (1957), taking ideas on space travel even further.